Wow what a stunner! Setting aside the really eye-catching combination of fabrics in this bag, it’s shape and style really set it apart. It’s going to look fabulous sat on your dressing table or on the counter-top in your bathroom. This little bag will hold lots of things like makeup, rollers, hair accessories, etc. It’s perfect for an overnight stay or two. The instructions include the piping, but it is optional if you are a beginner. Very easy, no fail zipper instructions. 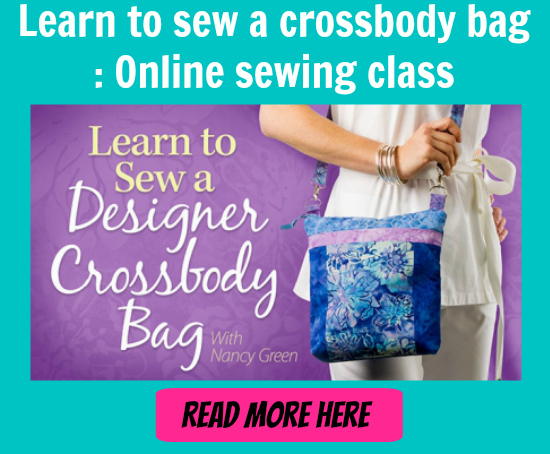 You can make your bag with 2 different fabrics for a fun look. The bag is padded and completely lined. There are no exposed seams on the inside, so no fraying. There is an optional handle too. The zipper is placed higher on the sides, rather than the more common middle placement, giving it a unique look.